Repti-view includes Vivexotic's easy vent system, an innovative cable access system allowing you to easily remove the specially designed access vents and remove cables and plugs. The secure auto lock feature will help prevent any potential escapes and comes with a removable key. 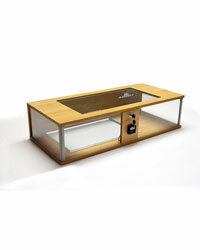 Repti-View also has an innovatively positioned external thermometer at the front of the vivarium, giving you a clear view when monitoring temperature and a protected heat mat enclosure incorporated into the base to prevent any accidental exposure to moisture. Made for terrestrial reptiles, Repti-View has been designed in a stylish oak wood to compliment any decor and is available in two sizes.